The rabbit god Frith is unusually forthright for a deity. 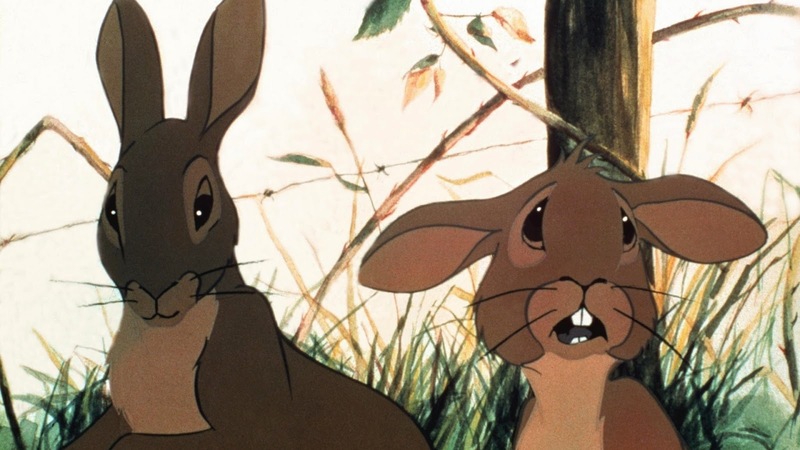 In the mythological preamble that opens “Watership Down” (1978), Frith punishes the arrogant patriarch of all rabbits by making all of the other animals stronger and warning that his descendants will be hunted by everyone for all eternity. At least Frith provides a glimmer of hope; as long as the rabbits are clever and “full of tricks” their people will survive. Literary agent Martin Rosen is similarly forthright in explaining why he wanted to adapt Richard Adams's popular 1972 children's novel: “I just loved the book so much.” Rosen, credited as screenwriter, director, and producer (Adams declined to be involved), had no prior filmmaking experience and was equally unfamiliar with the elaborate craft of film animation. He did, however, have enough connections to secure substantial financial backing that helped him build a studio, assemble a skilled animation team (including the great John Hubley who was heavily involved before he and Rosen parted ways), and eventually employ a raft of popular British actors as voice talent (plus American comedian Zero Mostel in his last credited film role). Along the way he preserved the essence of the story (or at least as I recall it from childhood), the convincing portrayal of a group of characters under constant threat of extinction. The main story kicks off when the timid visionary Fiver (Richard Briers) warns of impending doom; only a few rabbits listen to the little mystic and his more traditionally heroic brother Hazel (John Hurt), and a small hardy band of rabbits eventually leaves the home warren to find a dry, high refuge. Everywhere our plucky characters go, predators lurk. And they don't just lurk, they pounce the instant they spot their prey. Swooping hawks, sadistic tabby cats, barking dogs, and scavenging rats are always on the make for a good rabbit meal while impossibly gigantic cars and trains race by to crush furry little creatures underneath their metal wheels without so much as a second thought. People are heard off-screen though seldom glimpsed; their menace lies more in the form of encroaching industrial development that requires the elimination of annoying pests. The rabbits are well aware of their place in the natural pecking order, and that's what makes them even more courageous. As odd as it sounds, this film puts me in mind of Yasujiro Ozu's work with its acceptance of the inherent tragedy of life and the dignity one can achieve by enduring all of its trials and tribulations with grace. The Black Rabbit eventually comes for everyone, but if you've struggled bravely it's not necessarily something to be frightened of. The film uses multi-plane animation, lending the compositions a sense of depth and perspective. There are quite a few camera movements in the film, perhaps a few too many mechanical pans that call too much attention to themselves, but never enough to break the spell of this surprisingly gripping and suspenseful story. Each of the rabbits is drawn distinctly enough – some scrawny, some beefy – to individuate the characters and their wide-eyed faces engender sympathy without seeming too mawkish. Rosen insisted that the real locations that inspired the book be scouted to serve as templates for various scenes, and the effort breathes a sense of naturalism into the various pastoral scenes. I am not qualified to determine whether “Watership Down” is appropriate for all ages. I don't see anything that's more traumatic than Bambi's mom (sorry, spoiler alert there) but the film is definitely more intense than even the darker Disney films. For a cartoon about cute rabbits there's a shocking amount of bloodshed. They face peril on an existential level, making the tension palpable even for an adult viewer. I am qualified to say that Martin Rosen's passion project is a success, engaging even to viewers like me who are normally resistant to animated features. I expected to just politely approve of this movie without getting involved; instead I was pulled right in from start to finish and genuinely moved by the bittersweet ending. The film is presented in its original 1.85:1 aspect ratio. I have not seen any of the previous releases of the film for comparison. This high-def image is sharp with vibrant colors and the upgrade is clear when comparing it to the drab, degraded footage in the Trailer included on this disc. Colors are rich but not oversaturated giving it a fairly naturalistic look. The linear PCM 2.0 audio mix is crisp and rather robust. The voices are all mixed rather loudly with no particular relation to their depth in the frame, but that is surely the original sound design. The score by Angela Morley is effective without dominating as many animated scores can. The song “Bright Eyes”, sung by Art Garfunkel near the film's mid-point, sounds good and it's a fine song, but this is music video sequence is the film's most evident commercial sop and a genuine weak point. Optional English subtitles support the English audio. Criterion has provided the option of viewing the storyboards while watching the movie; a storyboard will pop up in the upper right-hand quadrant of the screen for virtually every shot in the movie. You have to access this option through the menu; I didn't find an “on the fly” method of switching. Criterion has also imported a feature from a previous DVD release. “Defining A Style” (2005, 12 min.) includes interviews with several of the many animators who collaborated on the film. There are two new features for this Criterion release as well. 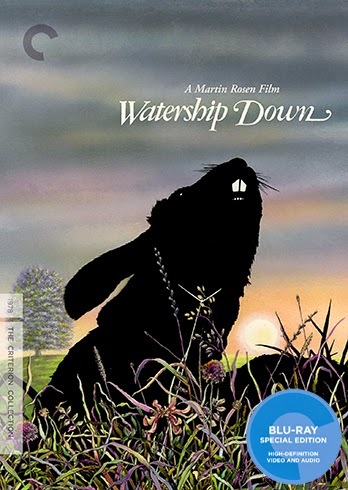 “Passion Project: Martin Rosen on 'Watership Down'” (2014, 16 min.) is an interview with the screenwriter/director/producer who had a clear vision for this unlikely project and saw it through over many years despite a lack of experience in filmmaking and animation. “A Movie Miracle” (2014, 12 min.) gives director Guillermo Del Toro the opportunity to wax rhapsodic about a film that he loves and which was very influential on his career. The slim fold-out booklet includes an essay by comic book writer Gerard Jones. While I like plenty of short comedy animation, I rarely enjoy animated features. 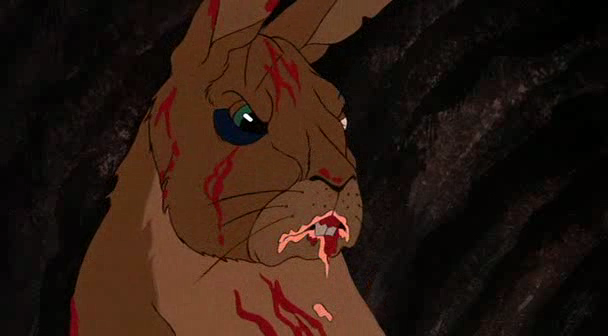 I wasn't particularly looking forward to watching “Watership Down” but I wound up being very pleasantly surprised. It's a tense, moving film with a wise acceptance of all the sorrow of life. Don't miss this one.